This is the much-anticipated chap follow-up to the renowned and widely-read journal for vintage gals, Her Vintage Life. Of course, this is not the first time my babblings have found themselves on magazine shelves, having written two gentleman’s guides in the delightful Pretty Nostalgic magazine. However, it is the first real feature containing actual pictorials of yours truly. The pictures were taken by the super talented Adele off of My Last Dollar Dress. Interested parties are directed to her Flickr webular page, The Fool’s Gold Mouthpiece Photography. With a three page feature on the topic of moustaches, I must confess to it revealing a rather shocking and uncharacteristic spurt of productivity on my part. Normal gentlemanly service will resume, I can assure you. Although I do have more exciting plans coming up that may require me to put another brief halt to my preferred leisurely pace. 1) This periodical can be quite the time stealer so it would be prudent to have a pot of tea and perhaps a selection of biscuits within easy reach. Or failing that, a bottle of single malt. 2) Have a peruse through the most popular posts from this periodical's past. 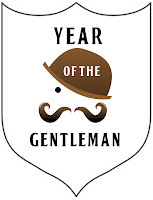 I recommend: A gentleman’s wardrobe: the basics; Merkur 34C HD – a mostresplendent razor; Bringing back the smoking jacket; A very vintage Christmas; A brief history of the pocket square; The gentlemanly art of self-defence; and Smell like a 16th century sailor. 3) Enjoy forty winks in the safe knowledge that you've earned it. 4) Upon being roused by a gentle prod and a fresh supply of biscuits, set course for the very beginning of this periodical: 'The quest begins!'. This should keep you out of mischief. Your marvelous lip-appendage has spurred me to move from the scruffy yard-brush (which I had started to grow) to head down the path of "Graspable Extremities". I am around 7 weeks in and, as it is not long enough to wax as yet, seems to collect every scrap and crumb of food and drink in the house. Most kind of you, old stick. I'm delighted to hear of the extension to your original lip weasel. From my experience, I'd say that once you pass the eight week mark, it will be plain sailing! Alas, food and drink will continue to be your nemesis but you learn to adapt - straws, handkerchiefs and tea spoons in my case. Please do keep me updated with your progress.